Is this the best engine treatment? With top 6 ingredients - maybe! What is the Best Engine Treatment? Could this be the best motor protector for your car? With 6 ingredients to end your valve tap. reduce oil burning. Stop compression blowby all to restore full horsepower, it could be! Check the list of comparable products to see why. Here is a list of popular additives and what I feel are their power working advantages. Not to many have more than one or two advantages. When you tear down an engine needing repair, there are 6 sub-systems that make it work. Any mechanic will tell you, the combination of the health of all of them are the causes for most repairs. The list shows the many items in the six areas needing cleaned. Will just cleaning and helping one or two areas be sufficient? Not likely. Its better to have a method to clean all 6. One brand, Mega Power fills that need. Our review of common part store products. A real engine treatment gets rid of power-robbing excessive friction drag, limits oil breakdown, cleans and frees, residue coated piston rings, slow-closing valves, rough bearing surfaces, thereby preventing, or ending the problems they cause the motor. It takes all that! All that is probably the answer to the question: "This is what your car needs as the best engine treatment for total clean and protection in its 6 areas. Your car will start easy, when Mega Power cleaned and produce more power going to the wheels with Mega Power friction modifying, and run instantly smoother and quieter - all helping it to last years longer with Mega Power MC+. The directions for Mega Power installation is easy covering those 6 areas. And, that is what revitalizes your car performance to what it use to be." Order now - get on down the road running great again. Order a Mega Power Engine Treatment. Includes 6 items and a bonus treatment for your transmission - a $29 value free. Ship to your door with easy-to-follow-directions, free phone help if needed. Guarantee. Just $80 plus $15s&h= $95 total. 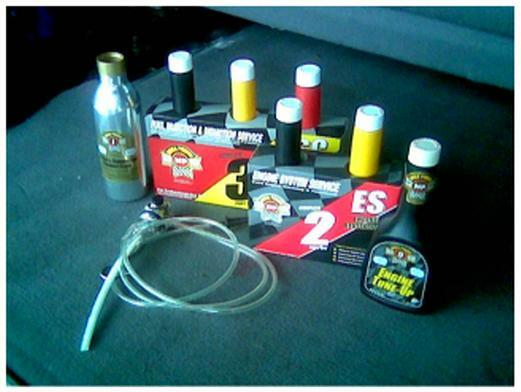 Some additive cleaners are passed-off as an engine treatment. So are tune up oils, and oil conditioners since they do go into the motor. However, those additives have proven harmful. However, the better additives also includes anti-wear and friction reducing advantage - and that is what Mega Power includes. You want, if you can include it, anti-wear and friction reducing advantages . Anti-wear and friction reducing advantages add year more like-new performance. That also adds to helping it to be crowned the best engine treatment. would have all the advantages and be better for that reason. That is the one we are want! Here is where it gets complicated - so.. . 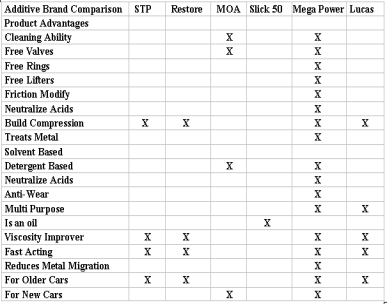 There is no one single product listed as the best engine treatment. There are far to many internal conditions to contend with. That is why I promote what I call "Treatments. They cover all problems - or to prevent them, and restore a great performance, and longer life. Why?.. is because like you and me, when ill, we cannot find just one pill, just one shot in the arm, as the cure-all for every ill. There is no one-magic-food or vitamin - and no one additive to keep us healthy. Same with cars. Those mechanics who trust Mega Power - the brand I favor, are schooled in this discipline to suggest what combination of ingredients are needed for your car need - like a doctor would do for your needs. I listed more than a dozen different combination's of additive formulas. Each have proven to be what is specifically needed fro a specific problem. They work well, just as the right key works well. My expertise is to explain what causes your problem or need, and suggest what is made for that situation. Each helps you avoid, or put-off the inevitable wear-out, and costly repair, or replacement scenario - many of us want to push way into our future. What works for each type of treatment need are packaged in a "kit treatment." Several specific types of cleaners, specific conditioners, acid neutralizers, polymers, metal conditioners, and of course, those proprietary ingredients. The latter pushing them to benchmark quality. It takes all that! All that is probably the answer to the question: "What is the "best engine treatment?" Best Engine Treatment,. Site Index.